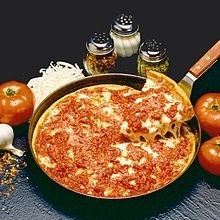 One of the great things about Chicago is the food. No better place to start our trip together than to familiarize you with a few ‘do not miss’ meals. Here is the recipe for the best hot dog ever. The secret is in the celery salt! There are so many great restaurants. 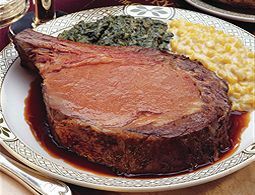 Two of my favorites for beef are Lawry’s at 100 East Ontario St (312-787-5000) and Smith & Wollensky Steakhouse adjacent to the Loop on State Street with a view of the Chicago River. There is a large outdoor patio we can enjoy and turn-of-the-century décor if you prefer to sit inside. (312-670-9900) A TIP: Having lunch in expensive places allows you to enjoy a recommended restaurant and avoid the pricer dinner menu. That’s what we will do if you tag along with me. 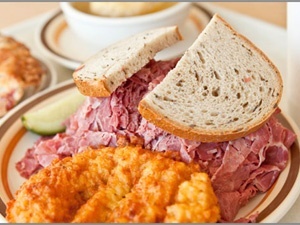 You can’t leave Chicago without have Chicago Style Deep Dish Pizza or a Jewish Corn Beef Sandwich on rye bread. 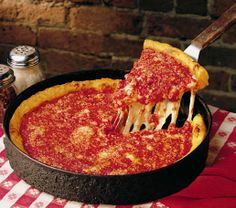 You haven’t lived until you’ve tried the pizza at either Lou Malnati’s Pizzeria or Gino’s East. 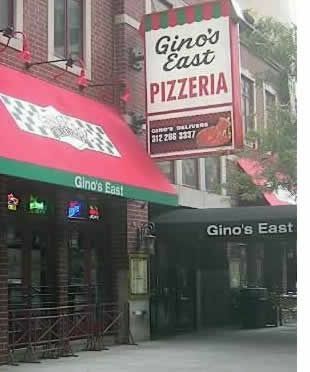 I’m hungry so let’s start with lunch at Gino’s East and afterward we will walk down Michigan Ave to do some window shopping ending up at Water Tower Place. 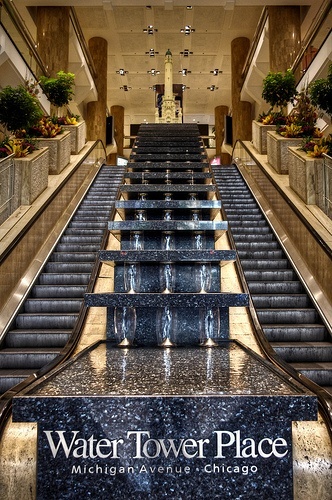 This entry was posted in Come Along With Me and tagged Chicago-Great Food, Gino's East, Lou Malnati's Pizzeria, Lowry's Prime Rib Restaurant, Smith & Wollensky Steakhouse, Water Tower Place. Bookmark the permalink. Hope that what ever has taken you to Taiwan is a rich and interesting experience even at the expense of a Chicago-style hotdog. Just writing the work makes my mouth water. Thanks for joining me on the blog tour. 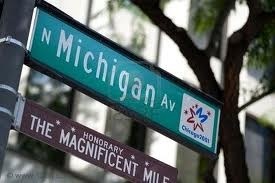 Can’t wait to see what you have in store for us on our armchair trip to Chicago!! Beingg an adopted South Sider, my favorites pizza places are the Home Run Inn, Connie’s and Giordano’s. And no trip to Chicago is complete unless you eat in Greek Town. My favorite place there is Diana’s Grocery. Happy to have these additional tips. I love Greek Town but haven’t tried Diana’s Grocery. Have no plants to drive north, but next trip, would love to try it. Thanks! 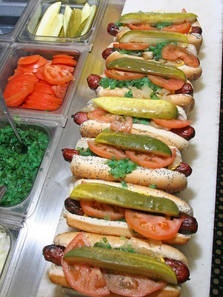 It’s almost dinner for me and now I’m craving a Portillo’s hot dog. Guess that’s a craving that won’t get fulfilled tonight.